With Spring almost upon us, and increasing demands on my time, organizing my thoughts has become a must do. This pressing need spills over into my meditation practice as well. And, as I become more deeply entrenched in the demands of mundane life I am going for quality not quantity of time spent in reflection, communion and interaction with my spiritual self. To support this state of being I like to identify a few core foci to work with continually, over the months. Usually, each builds upon the other, much like the waxing of the Light half of the Year. As I looked through copies of readings or exercises that I thought would be excellent tools for meditative practice, I realized that the random books, magazines or web articles seemed cumbersome and something I would not return to frequently. And, more importantly each time I set off for my evening meditation, I did not want to spend most of the allotted time finding what had drawn my attention initially. Eureka! I could use my index cards! I routinely use blank index cards to record notes to myself, make my to do lists and throw in my purse as reminders for family and personal events. I like the flexibility of this method and most of all appreciate the fact that they easily and lightly fit in a purse, bag or even within the pages of a book I am taking notes on. Now, to most the connotation of “a house of cards” has always been a negative one, filled with the imagery of a structure easily blown apart, likely to fall and just not durable. However, there is much to be said for Intent and Will as being the mortar that holds the house together. I write out (or copy, if lengthy) the information that I will use as my focus for the intended focus of multiple meditations. They are kept in a beautifully decorated box and as I prepare to sit for my meditation, I select and reread or refresh my intent with the appropriate card (s). It may seem like extra work or you may be thinking “why anyone would need a card as a reference point?”. The key, for me personally, is the additional engagement that I am offering up to my intention. Taking the time to plan out, write out or read through makes use of the physical senses that contribute towards a synthesized and fully present process. This manner of focus and direction pinpoints precisely where I wish to hold my consciousness as I begin my meditation. And, the greater outcome is that these simple, yet deeply connecting actions form the structure, framework and foundation that I can use as I open to accommodate and hold the energy of the higher connection with the Divine. This is the House in which I find communion with my Higher Self. 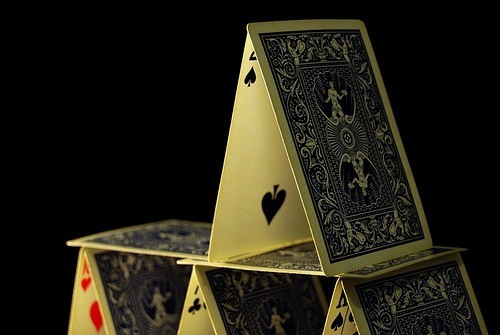 This is the House of Cards that will stand strong for eternity.